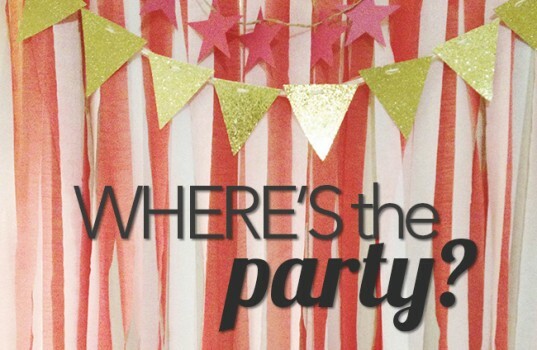 STRESS-FREE PARTY PLANNING: It’s possible. Just tap into your inner Scout. I’m the party planner in my circle of friends. I’m the one who suggests a party for every birthday; July 4, Martin Luther King Jr. day, and any Wednesday, Friday or Saturday that our friends don’t have plans in between. I’m also the one who, for years, would spend half of our parties darting in and out of the kitchen, trying to make sure everything was finished – all the food was out; everyone’s drink full and belly happy. As all you other natural born entertainers can attest to: that is not the greatest place to be. While a certain amount of checking in should be a part of any event, the entire point of the party is to have fun and make memories. Being stuck in the kitchen the entire night isn’t really the best way to get that done. We all know that the Boy Scouts of America were really talking about event planning when they first coined their famous tagline: Be prepared. When it comes to events, if you are prepared by having thought out beforehand every situation that might occur so that you know the right thing to do at the right moment, you’ll be a happy party-planning camper. One “simplify” would have sufficed. That’s the key to being prepared. It is all too easy to get lost in the annals of Pinterest and attempt to throw a Pirate themed under-the-sea bubble shaped Bob-the-Builder construction party with a build your own Disney princess crown activity. Instead, simplify. Start by picking a theme. If you’re throwing your child a party, birthday or otherwise, seek their opinion. Do they like Barbies? Pirates? Race Cars? What are they babbling non-stop about? One Direction? Great. If you were a Boy Scout building a fire, you’d start small and build up. Let’s do the same here. Once you have your theme, walk through the steps below to get that party-planning badge you always wanted. Invitations are not my strong suit. In no way am I a graphic designer, and I certainly don’t have a best friend with handwriting that they’ve turned into a ridiculously popular font. That being said, I can handle writing down the date and time for an event, filling in what attire the guests should come in, and noting the date by which they should respondez – sil vous plait! If you start with your theme here, it will be easier to keep a through line going with your décor, food, desserts, and entertainment. Pirate party? Keep the invites simple by starting a color motif with red and black, or black and white. Ask the guests to wear at least one pirate themed article of clothing. Don’t want to spend money on paper and postage? Send an e-card or text message! As Giada DeLaurentis says, talking and cooking can be like patting your head and rubbing your stomach at the same time. Which is why she also advises against making your appetizers on the spot. I’ll go ahead and suggest the rule of threes: two appetizers and a main course. Have little pirates to feed? Small snacks are great. Popcorn as pirate booty, apple slices skewered with cheese to make wee ships and sea dogs (hot dogs), crabwiches or some “seaweed” salad will round out the menu without much fuss. There are really two ways to go with décor: you can keep it dedicated to one room – a single focal point, like the table you place the food on, or, you can spread out simple touches of thematic motif throughout the space in which the party will be taking place. The more rooms you want to decorate, the more time it will take. If you’re dying to complete that latest Pinterest project, make sure you pick just one or two. Not a crafty mom or dad? Here’s where your neighborhood Target will come in handy! Target now offers nearly an entire aisle of coordinating plates, napkins, straws, banners and paper lanterns. All for mere dollars. With all the to-do about food and décor, the games at a party can often be overlooked, yet can provide some of the longest lasting memories of the party– for you and your guests. And, like the food and décor, games and activities don’t have to be complicated. Rascally four and five year-olds giving you a heart attack? Take them outside for a pirate ring toss. All you need is a cardboard box, some fun looking wrapping paper, and a couple of dollar store plastic pirate hooks to toss the rings onto. Need some easy prizes for the winners (and everyone else)? Nobody does prizes like the Oriental Trading Company. Haven’t heard of it? Simply go to orientaltrading.com. A dozen treasure chests or some golden loot to satisfy the need for treasure? No problem. Don’t want to decorate yourself? Don’t want to cook, or simply don’t have the time to watch the kiddos, organize a fiesta, gather up the pirate booty and entertain the night away? Outsource. There are many companies who entertain for a living, so you can remain stress free. Simply looking for ideas to get your creative juices flowing? Look no further! Whether it’s an all-adults cocktail night or a screaming buccaneer battle, you can make memories and keep them stress at bay. Just remember what the Boy Scouts say: be prepared. 1. Turn simple foods into themed elements, like these wee ships and sea dogs for a pirate party. 2. Simple games for great memories – sometimes all you need is cardboard box, wrapping paper and a couple of dollar store plastic pirate hooks for ring toss. 4. Target party aisle at work! Themed straws, napkins & Homemade Cranberry Sauce.